The Knutsen Family: All I want for Christmas is MY 2 front teeth!!! I sent Adam off to school on Thursday just like any other day. However, just as I was coming back from lunch I got the dreaded phone call from the school nurse. My first thought was, Adam seemed just fine this morning. 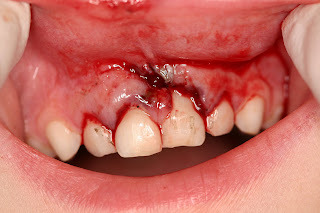 The nurse proceeded to tell me that Adam took a pretty bad fall at recess and although they had the bleeding under control, she wasn't comfortable with how his teeth and upper gums were looking. I thanked her and hung up and called my mom and asked her if she could get Adam from school and bring him to me. I was just walking into court so I didn't have a lot of time. I called Scott and told him what had happened and to be prepared in case he needed to take Adam to the dentist. When she brought him to me I was completely shocked to see his lip about 3x the normal size and then I looked in his mouth and this is what I saw. If you have a weak stomach you may not want to scroll down any further. Adam spent about 3 hours at the dentist. He numbed him up pretty good and Adam hardly budged when the dentist was in his mouth, pulled the teeth, irrigated the gums and scraped the asphalt off his jaw bone under the front teeth and added a few stitches to be on the safe side. The poor thing, the next day his upper lip was about 10x the size it normally is. As the morning went on, the swelling went down and he was acting like nothing ever happened. I on the other hand was still shaking from the trauma that I went through watching his teeth be pulled, stitches and all the blood. The next day we kept Adam home from school. He was feeling pretty good and really didn't have any serious complaints. I was fully expecting a lot of whining and crying when he woke up. He was pretty excited to have tooth fairy come so when he reached under his pillow in the morning and pulled out a $10 bill he couldn't have been more excited for his accident the day before. He had a pretty good time showing his new smile and his new found treasure. Bye Bye Baby...right? Somehow when those two front teeth come out, it ages them dramatically! He looks like a big kid now!